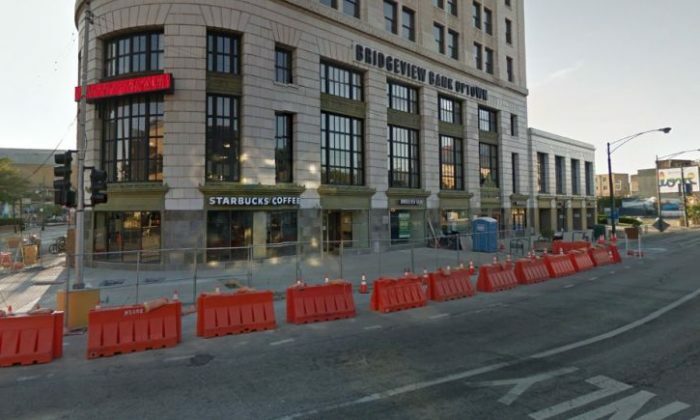 Chicago officials revealed more details about Thursday’s shooting at a Starbucks in the Uptown neighborhood that left one man dead and two wounded. The man who was killed had just completed a drug deal and was carrying narcotics and a gun when he was gunned down, police told the Chicago Sun-Times on Friday. Sauvignon Watkins, a father of two, was identified as the victim, confirmed Chicago Police and the Cook County medical examiner’s office. The drug deal began near Broadway and Wilson, said Town Hall District Cmdr. Marc Buslik, adding that Watkins and a 24-year-old man who wounded by the gunfire were involved in the drug deal. His identity was not released. A 12-year-old boy was also shot. The 12-year-old and the 24-year-old were waiting for Watkins in the Starbucks when the gunman, clad in a ski mask, opened fire, Buslisk said. However, police later told the Sun-Times that the boy was “not connected to the incident,” and they confirmed that he was shot in the groin and is in good condition. “As far as we can tell, this was not a random act,” Buslisk added. Cappleman slammed the Starbucks, claiming that other drug deals have been done there. “Heard two shots, then a pause. I grabbed my wife and kind of pushed her down and said, ‘Shots!’ Then there were three more, almost within a few seconds,” said Mike Swaiko, a witness, ABC7 reported. “It was gunshots. By the time we got in there, they had already, like, told everyone to get cover,” said Maureen Swaiko, another witness. Starbucks issued a statement Thursday night on the shooting. “We were saddened to learn of the passing of a young man and the injury of two others as a result of gun violence at our store,” it said, adding that it will keep the store closed Friday. The suspect hasn’t been caught yet. The shooting is still under investigation. The Chicago Tribune reported that two people were killed three were injured in shootings across Chicago, including the Starbucks incident. In another incident, a 29-year-old man was found shot dead in a car in the far South Side’s Roseland neighborhood at around 10:05 p.m.